New import tariffs are likely to hit SunPower harder than most in the solar industry. The company -- based in Richmond, Calif. and majority-owned by French oil giant Total -- could be hit harder than most in the U.S. solar sector due to its international manufacturing base in the Philippines and Mexico, a well as its high-efficiency solar panels with advanced technology that takes on a price premium. While seeking an exclusion from the import tariff, SunPower said in its fourth-quarter earnings call last week that it is already experiencing negative effects on its business as a result of the increased costs from the Section 201 trade case. The import tariffs “have delayed certain 2018 projects and made other projects uneconomical,” said SunPower CEO Tom Werner on the call. Werner said the company has already implemented a hiring freeze and has reduced some discretionary programs. SunPower released additional information on its cost-cutting efforts today in an SEC filing, including plans to reduce non-manufacturing headcount by 150-250 employees by mid-2019, representing approximately 3 percent of the company’s global workforce. SunPower expects to incur restructuring charges totaling $20 million to $30 million, largely related to severance benefits and real estate lease terminations. Last month, the company announced that it had pre-emptively stopped a planned $20 million investment that would have been used to expand manufacturing of the company’s next-generation solar cells. The move led to the loss of hundreds of new jobs that would have been created in California and Texas, said SunPower. While the tariff could give a boost to solar companies that manufacture cells and modules in the U.S., it will raise costs for companies making solar cells abroad, as well as companies relying on low-cost imports of solar cells and modules made outside of the U.S.
GTM Research predicts that the price of solar panels will rise by 10 cents a watt on average in the first year of the tariff. At the same time the U.S. solar industry is expected to see a net reduction in installations of 11 percent this year. As GTM Research's MJ Shiao put it, the tariff will have a “meaningful but not destructive impact" on solar installations in the U.S.
SunPower could avoid the negative effects of the tariff on its business if it can manage to convince the Trump administration to give it an exemption. Companies can apply to have certain solar products exempt from the import tariff. SunPower said in its earnings call that it should be exempt because only it can make “a copper-plated, interdigitated back contact solar cell.” With the exclusion, the company said it would be able to invest in further research and development of that technology. From “what we've read so far, [it] suggests that we're a good fit for exclusion. We’ll see,” said Werner. Werner also said that if the company receives an exemption, it would likely be able to recapture the majority of the lost business. Companies need to file for exemptions with the Office of the U.S. Trade Representative. Details of the exemption process were announced on February 14 (the day SunPower held its earnings call), and companies have 30 days to file for the exclusion. There will be another 30 days of a public comment period, and then the administration will make its decisions. However, in case SunPower does not receive an exclusion, the company is already looking to cut costs. SunPower has also been in the process of streamlining its business and improving liquidity before the tariffs were announced to address fluctuating global solar markets. In the run-up to the exemption decision, SunPower said it has been building up safe-harbor inventory in the U.S. It’s got at least three months' worth of tariff-free solar panels stocked. At the same time, the company has been looking to grow its international business. 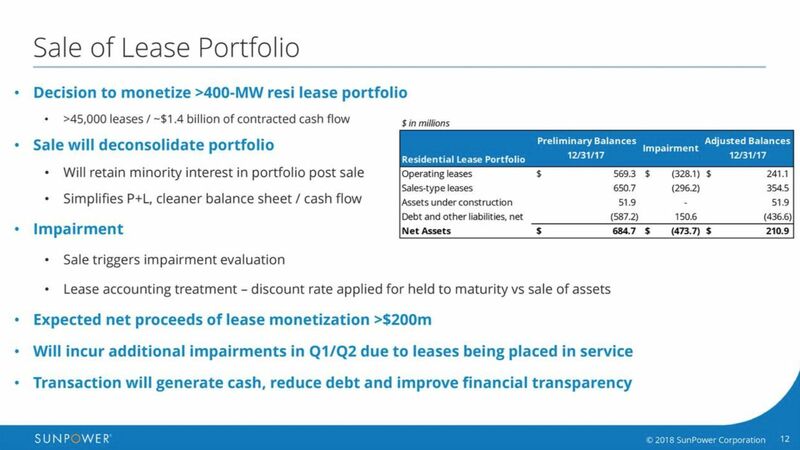 One of the strategies that SunPower has used to create more liquidity has been to sell off assets. That started with the sale of SunPower’s stake in YieldCo 8point3. 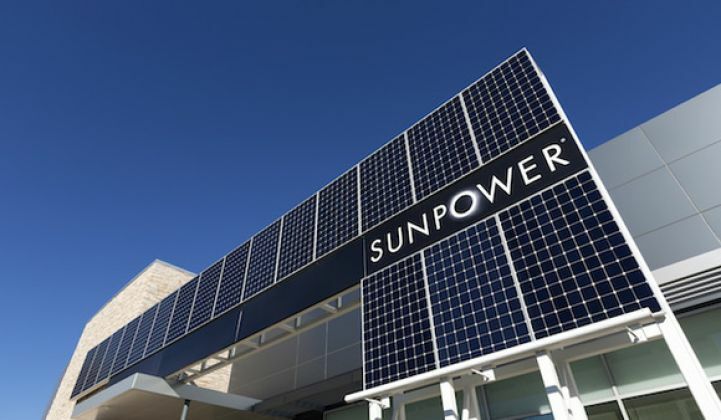 SunPower plans to use the proceeds from the lease sale to help pay for a $300 million convertible bond due in June. However, the leases have been estimated to hold long-term value of $1.4 billion, and SunPower was also forced to take a non-cash charge of $474 million in the fourth quarter. Overall, Wall Street didn’t take kindly to SunPower’s earnings and cost-cutting news last week. The company’s stock dropped close to 5 percent on earnings day, though it has since rebounded.